MeNotForget is a simple and cool to do list, optimized for the iPhone. Using MeNotForget allows you to create lists of the things you want to buy such as grocery, and it is pretty simple to use. To add an item, just click on "New", and if you need to change it or delete it, all it takes is a simple click. 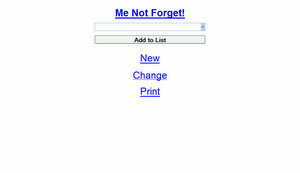 To do Lists created by MeNotForget can be used on multiple computers by linking an email address to the list. Rather ugly to be honest, nothing ajaxed so the interface is rather slow. Do not like.